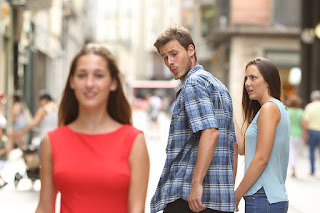 Sliding vs Deciding®: This blog is about romantic relationships and marriage, with insights from relationship science about how relationships develop and what makes or breaks them. Our newest journal article is out. It's about the characteristics of individuals that are associated with it being more likely to be an asymmetrically committed relationship (ACR) compared to those not in such relationships. The study focuses on a sample of unmarried adults (aged 18 to mid thirties) in seriously involved relationships. Asymmetrically committed relationships are more likely to break up (especially if the woman is the less committed partner), more likely to be unhappy, more likely to include physical aggression (by either partner), and more likely to be found in cohabiting rather than dating, but not living together, relationships. Regarding commitment and attachment, those with attachment avoidance tend to hang back and those with anxious attachment tend to hang on. These are not surprising findings but it is important to observe them not only in regarding to mere high or low commitment, but regarding being in the higher or lower position of commitment in an asymmetrical relationship. There are other findings covered in the paper, including about numbers of prior sexual and/or cohabiting partners, infidelity, and so forth. The paper covers the existing literature on ACRs pretty deeply, so it provides a great way to get a solid sense of what is known on this topic. The paper also provides suggestions for working with individuals or couples in therapy or relationship education based on the existing, and growing, literature on asymmetrical commitment. To read the abstract, click here. To see me discussing the study in a "video abstract" for the The journal Family Process, click here. For an earlier summary on this blog of our research on unequally committed relationships, and their numerous negative characteristics, click here. If you have no way to access the entire article and want to read it, email me at my university email address, on this page. NARME (National Assoc. of Relationship and Marriage Ed. Motivated Ambiguity: "Is this a date or not?" What Is the Divorce Rate, Anyway? Black Jack or Roulette? You Choose. What Happens in Vegas . . . I am a research professor who conducts studies on marriage and romantic relationships. Along with my colleagues, I also develop materials to help people in their relationships based on research. In addition to academic publications, I have written or co-written a number of books (see below). Together with colleagues Howard Markman and Natalie Jenkins, I head up a team at PREP, Inc. that produces various materials for use in marriage and relationship education. Howard Markman, Galena Rhoades, and I head up our research team at the University of Denver. Sliding vs. Deciding is a theme that comes out of my study of commitment and my work with my major colleague in this work, Galena Rhoades. I believe “sliding vs. deciding” captures something important about how romantic relationships develop. The core idea is that people often slide through important transitions in relationships rather than deciding what they are doing and what it means. For example, sociologists Wendy Manning and Pamela Smock conducted a qualitative study of cohabiting couples and found that over one half of couples who are living together didn’t talk about it but simply slid into doing so, paralleling prescient observations from Jo Lindsey in 2000. In our large quantitative study of cohabitation, we have found that most cohabiters report a process more like sliding into cohabitation than talking about it and making a decision about it. In contrast to sliding, commitments that we are most likely to follow through on are based in decisions. In fact, commitment is making a choice to give up other choices. A commitment is a decision. Do we always need to be making a decision about things? I hope not. But when something important in life is at stake, I believe that deciding will trump sliding in how things turn out. One of the most important implications of the concept of sliding vs. deciding is when this theme is married to our work and thought on the depths of ambiguity in relationship formation these days and our ideas about inertia. What people are often now seeing is that they are sliding through relationship transitions that cause them to increase constraints and lose options before (or without) noticing that they have just entered a more constrained pathway. As a result, we believe that many people are too often giving up options before they have made a choice. That is far from making a choice to give up other choices. That's losing options because one is not noticing an important, or even potentially high cost slide, is not what solid commitment formation is about. Three of the most important theory papers written by me and Galena Rhoades are accessible above at the links: "Sliding vs. Deciding: Inertia and the Premarital Cohabitation Effect", "Commitment: Functions, Formation, and the Securing of Romantic Attachment," and the link labeled "SvD Transition and Risk Model." Stanley, S. M. (2005). The Power of Commitment. San Francisco: Jossey-Bass, Inc.
Markman, H.J., Stanley, S.M., & Blumberg, S.L. (2010). Fighting for Your Marriage. San Francisco: Jossey-Bass, Inc.
Stanley, S., Trathen, D., McCain, S., & Bryan, M. (2014). A Lasting Promise. San Francisco: Wiley and Sons, Inc.